A couple of years ago, the bullies who call themselves "The State of Texas" decided to make up a new evil rule: they decided to forbid driving in the left lane of divided highways, except for passing. 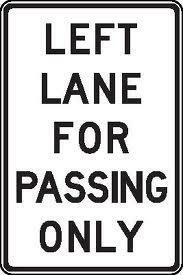 They have erected new signage, paid for with stolen money: "Left lane for passing only". Well, so then what did these government idiots do? They tore up the right lane's surface so badly you can't drive any distance on it without fighting to stay in control while risking a blowout. Only the right lane, of course. For miles. I took a couple of little trips recently- of only about 40 miles round trip- but almost the entire trip was on this destroyed surface. I noticed that just about everyone on the road ignored the dumb rule- which is heartening. The entire line of traffic was ALL in the left lane for almost the entire stretch. I'm sure if one of the armed bullies had seen us, he would have stopped, robbed, and molested someone, but he couldn't have gotten us all. I have wondered if this is just a money-making scheme. The highway has been torn up like this for months- in preparation for "resurfacing", I'm sure. But there are no signs saying anything, and no equipment at the ready. How much money are they stealing above and beyond their normal take due to the condition of the road? Is this why they are in no hurry, and haven't suspended the dumb rule for the duration?